church in Michigan, Dr. Bill Rice, founder of the great revival ministry of the Bill Rice Ranch in Tennessee, took some interest in me and invested some time when he was at our church to talk with me about important matters which would affect my future ministry. Among the most practical things he taught me was how to take a “special offering” in church. Since then I have used this approach over and over again to encourage people to participate in free-will offerings for missions, for particular servants of God, for worthy projects, and for special needs in the church. A free-will offering is an important opportunity for God’s people to exercise faith and to express their love for the Lord (Second Corinthians 8:1-8). On at least three critical occasions, God gave His people projects that called for a free-will offering: the offering for the Tabernacle in the wilderness (Exodus 25 and 36); the offering for the Temple to be built by Solomon (First Chronicles 29); and the offering for the poor saints in Jerusalem, taken by the apostle Paul (Second Corinthians 8-9). The scriptural accounts of these phenomenal examples of voluntary giving are all very instructive to us, and Dr. Bill’s approach to the subject was very instructive to me regarding how to encourage people to participate in such efforts. Simply put, as I remember it, this was what he taught me. 1. Approach the offering as you would a revival service. Think of it as preaching a sermon, and extending an invitation. Giving is serious business, calling for our undivided attention. An offering for a special cause should be preceded by a serious talk that calls for a deliberated decision. 2. With the help of the Lord, impress upon the people the importance of the need before them. Be specific and clear about what the need actually is. Businessmen and thinking people appreciate this. 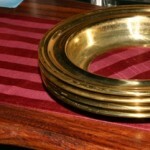 Explain what the need is and why the offering is being taken. Be specific and straightforward concerning the amount that is needed and how the offering will be used. 3. Then speak directly to the responsibility each one has to participate in meeting this need. Perhaps provide special offering envelopes, and have them distributed to everybody. Impress the congregation that everyone present has an obligation to ask the Lord what he should do to help meet the need. Gifts of all sizes will be important in supplying the whole need. God has a will for each one concerning this matter, and will give wisdom to each person concerning his part. We should all ask the Lord for this wisdom and direction (James 1:5). 4. Suggest that everyone pray for God’s direct leading in how much each should give. Surely if one each gives what the Lord directs him to give, the right amount will come in and the need will be met, to the glory of God! 5. Give the congregation an opportunity to pray before preparing their offerings. This time of prayer is before the plates are passed. Perhaps the congregation can be encouraged to pray over their offering envelopes while music is being played. Perhaps the preacher can lead in a prayer briefly at the beginning of this preparation time, asking the Lord to lead. 6. Give them time to prepare their offerings. Have the music continue as the people prepare to give the offering God has directed them to give. Checks can be written, cash can be taken out, and envelopes can be filled at this time. 7. Have the ushers collect the offering. The usual prayer over the offering, asking God to bless it and meet the need, should be offered just before the ushers begin the collection. The offertory will be played while the offerings are collected. This process will take some time and should be conducted in a cheerful but serious manner. Freewill offerings are a serious matter, and can be hindered by rushing or fooling around. The Lord does have a purpose to fulfill in every life through a special offering, and preachers should lead in the process with reverence and appropriate attention. Over my years pastoring, I found these suggestions very helpful when the church considered a special need. Among other benefits, it focused our minds on the importance of what we were doing, and encouraged the people to pray for divine guidance. And often the results were beyond our human expectations and glorifying to the Lord. The need was met by God through His people.